This was supposed to be the best summer of Lauren’s life. It turns out to be the worst. After Lauren wakes up in the hospital and learns that her boyfriend Ryan has died, her life slowly begins to unravel. She soon begins receiving mysterious text messages that make her wonder if his death was even an accident like everyone is saying. She finds herself leaning on Nick, her boyfriend’s best friend, for support. He tells her tidbits about Ryan’s life that make her wonder if she even knew her own boyfriend at all. Now, she’s even more determined to learn the truth about Ryan’s death and she wonders who she’s able to trust. She starts confiding in her best friend, Bryn, until she remembers something about the accident that makes her wonder if she’s trusted the wrong person the entire time. She’s determined to get justice for Ryan, but can she do it without losing her best friends? Tricia: Tell us a little about yourself. Katie: I'm in my early thirties, married to the love of my life and we live in Pennsylvania with our two very spoiled cats. I hate cold weather, love sitting outside with a good book and coffee is a necessity in life. Katie: I began writing when I was about six or seven years old. I even still have the "books" I made when I was that age somewhere in the house, but it wasn't until I was in my mid twenties and married that I really began to get serious about my writing. 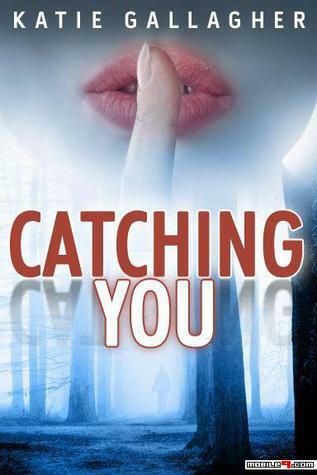 Katie: My debut novel, a young adult mystery suspense novel, Catching You came out in November of last year from Lazy Day Publishing. Katie: I'd already tried writing a young adult romance novel and thought that I'd see if I was any good at writing mysteries. It started out as a play on the movie, I Know What You Did Last Summer and by the time I was done writing and editing it, it turned out to be like an episode of Pretty Little Liars. Katie: For me, it wasn't the writing part that was tough that first novel, but sitting down and editing it afterwards. I agonized over every little word and felt like I was going insane. With the second novel, it's trying to figure out an ending for this dang thing! Katie: I'm writing the novels in different characters perspectives. Catching You was in Lauren's voice and The Betrayal is in Elizabeth's, so I think I have to say it's which ever character that I'm dealing with at the moment is my favorite one. Katie: Sara Shepard, best selling author of the Pretty Little Liars series. Katie: I whine that someone didn't like it for about an hour and then I get back to writing. If someone didn't like my book that's their loss. They are many more people that do like my writing than don't. Tricia: If you were stranded on a desert island and could only have five books with you, which books would you choose? Katie: Prozac Nation by Elizabeth Wurtzel (I know, how depressing), Hunger Games by Suzanne Collins, Kindred in Death by J. D. Robb, Outlaw Demon Wails by Kim Harrison and last, but not least....Twilight by Stephenie Meyer. I know, they aren't books that make you think, but they are books that I can read over again. And. you never know, but, Hunger Games might have some insight on how to survive on an island too! Katie: I didn't have a playlist per se, but more a bunch of songs that I liked to listen to while I was writing. It often depended on what I was in the mood for at the time. I listened to everything from Nickelback's Far Away to Taylor Swift's Love Story. Katie: Don't give up! I know that probably sounds cliché or you've heard it a million times, but it's true. If I'd given up on this novel the first time that I thought my writing sucked and everyone would hate it, I wouldn't have a publishing contract right now.